Guided Missile Bills guard the fabulously furry Tanooki Suit. You have to like the Tanooki Suit. Not only is it cool looking, it gives Mario the same powers as the Raccoon Suit, as well as the ability to turn into a Statue! The Tanooki Suit has the power to turn into an invincible Statue for 5 seconds. But it's not generally know that this power can be used offensively against enemies like the Lava Lotus. Statue Mario can even fit through small gaps! 1: Kick the Green Gargantua Koopa Troopa's shell into the ? Block to reveal a power-up. You'll get a Super Leaf if you're Super Mario. 2: Missile Bills are guided, so they won't give up until they've hunted you down. They'll track back and forth waiting for you, but you merely have to stomp on them to disarm them. 4: The Tanooki Suit. While standing on a cannon below, jump on top of a passing Bullet Bill to bump the ? Block to make a vine grow into the sky. Climb it and enter the pipe to gain access to a secret area (shown right) containing the cute and furry Tanooki Suit. When you enter the secret room, get the suit first. Then hit the Switch Block and quickly exit the room the same way you entered. Follow the trail of coins on your way down. Step through Magic Doors to enter alternate dimensions big and small. Here's a stage where you can change the size of giant enemies. Two magic doors accomplish this feat, and also make different items come out of the ? Blocks. In effect, this stage contains a giant side, and a regular side. This being Giant World, you naturally begin the stage on the giant side. 1: On the giant side where you begin, crush the blocks to reveal a 1-Up. On the small side, you'll find a Starman in a different block instead. 2: This is the second of two doors that, when you pass through them, not only change the size of the enemies, but they also reset the items once they've been collected, making repeated collection possible. 3: On both the regular and giant sides, fly to the clouds to collect some coins. Only on the regular side, however, will you find a 1-Up as well. 4: Jump to reveal hidden blocks on the regular side and you'll be rewarded with a 1-Up. Be careful not to let the Koopa Troopa corner you, and watch yourself—if you kick the Koopa shell, it could spell trouble. 5: Enter a Magic Door to reset all of the blocks in the stage. You can pass through the door to collect coins several times, but don't expect to collect 1-Ups over and over again—they won't be there the second time. Don't dawdle on a Donut Lift, or you'll be in for a very hot bath. A Switch Block will reveal the way to a Hidden Quarter of the Fortress which gives you a chance to gain some extra coins and, of course, 1-Ups; plus some extra practice with pipe maze tactics that will come in handy in World 7. 1: Defeat Dry Bones first! You'll have to act fast on these Donut Lifts. Stomp Dry Bones, collect the item, and hit the road. Try not to panic. 2: Use the button dash here. Hesitate on the upper donut lifts for just a moment and Dry Bones will fall into the lava. Be careful not to hesitate too long! When the coast is clear, hold down and run and jump to the upper platform. 3: When you hit the Switch Block the door to the Hidden Quarter will be framed by silver coins. Run to the door and press to enter the secret area. The Hidden Quarter is the long way to BOOM-BOOM but it gives you a chance for four extra lives and some coins. You will enter at the bottom of the left map below. 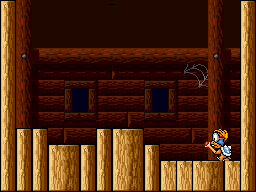 B: Get in position just to the right of the center floating block to take on BOOM-BOOM or use platforms to pounce from above and bust him up with three quick smacks on the head. 4: Arrow Lifts: These lifts will move in one direction, whichever way the arrow is pointing. They also disappear if you hit your head on something while standing on them. All Directional Lifts will also fade after a short time. 5: Directional Lifts: Every time you jump while riding on this lift, it will change direction. You need to plan which way you go carefully; if you hit your head on a wall while you're standing on it, the lift will disappear. You can jump off the lift, hit something, and get back on, and it won't fade away. 6: Go up through the maze of pipes. Carefully observe the way these pipes function. You'll encounter similar pipe mazes and Directional Lifts in later stages, especially in World 7. 7: Use Hidden Blocks to make your way to the 1-Up. You'll catch a glimpse of the 1-Up Block as you fall. Make invisible blocks appear to form a stairway up to it. You'll have to jump up off the screen to reach this 1-Up. 8: More bonus coins for Raccoon Mario! Fly up to the upper left corner of this room and you'll end up in another area where you can get 30 extra coins. It'll take quick wits and iron nerves to traverse Iggy Koopa's enormous rocket-powered airship. Unlike the other Koopaling's Airships, Iggy's ship has no cannons or Bullet Bills, only thrusters, but it can be tricky! 1: If you're confident in your jumping skills, you might want to utilize the Bolt Lift. The upper path is safer than the lower. Jump repeatedly to move the Bolt Lift across the pit lined with Rocket Engines. If you fall off, you'll be scorched. 2: If you're forced to take the lower route, wait until these thrusters fire before you jump over them. If you don't watch your timing, you might get a blasted with flame. 3: It's kind of tough to get the power-up if you take the lower path through the Airship. Rocky Wrench will attempt to ambush you as you collect the power-up in the ? Block. If you're small, make sure the Super Mushroom falls to the right or you won't be able to collect it. 4: Don't get burned. It's easy to avoid the flames here by kneeling on the step. The two upper rockets are hard to get through, but there's a second power-up item in case you get hit. 5: Before you eagerly plunge down the pipe to face the boss, grab the power-up sealed in a ? Block. This is the only airship with two power-ups. Two power-ups, no cannons… always make the most of a good situation. Iggy Koopa's wand isn't as dangerous as his sister Wendy's, but he fires it rapidly and the uneven terrain can make dodging difficult. Iggy may look like a bookworm, but he's no genius. Quickly jump on Iggy before he can shoot at you. Remember, Iggy is most dangerous when he spins inside of his shell. Jump to avoid the rings from Iggy's wand. Be sure to stay mobile and attack quickly, and don't allow him to corner you. The faster you can defeat Iggy, the less time you'll be in danger. Three strikes to the head will finish the job. Another grateful King bids Mario good-bye. Mario's next challenge will take him into the clouds in Sky World. The Princess, thoughtful friend that she is, left a P-Wing behind for Mario to use. And he'll need it in the Sky! This page was last edited on 6 January 2019, at 02:59. This page has been accessed 53,209 times.